The Bracketron iTilt stand is really designed around the first generation iPad, but the iPad 2, 3 and the new fourth (4) generation are all compatible too. It is also suitable for use with many other branded tablets, including the Samsung Galaxy Tab. Made out of a very hard and sturdy plastic, the iTilt is rugged, slim and compact. The unit folds into itself, making it remarkably easy to travel with. It comes in just the one colour which is a black. To set up the iTilt you simply pop out the back, which folds down onto the surface it's resting on, and then a metal arm secures the stand by lodging itself into one of the nine notches. The further forwards the metal leg is inserted into one of the notches, the more upright the angle is. This method implemented for adjustment is quick and simple, we liked it a lot. As already mentioned, this stand is compatible with the iPad 1, 2, 3 and 4 with or without a thin case or skin applied. But the really neat feature is that an iPad and other branded tablets can be used in either portrait or landscape view. We tended to use the iTilt on our desks in portrait which is a feature cases tend not to incorporate within their stand functions. When on the go we prefer to use devices in landscape and the iTilt does sport an angle low enough to comfortably type on too. Interacting with a device that is sitting within the Bracketron iTilt Stand is a very secure and definite experience. Some stands don't hold the devices in such a firm manner and this results in bouncy feedback, terrible when playing games and using Apps that require precision. So the iTilt is excellent in this respect. 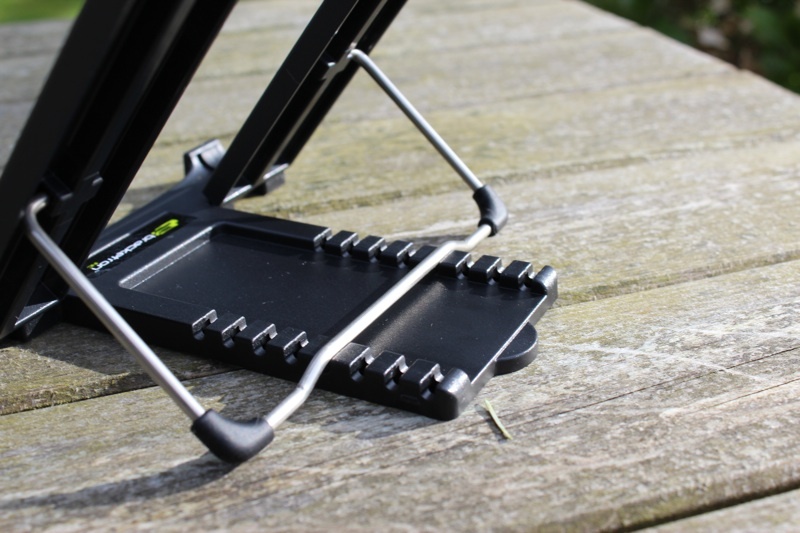 Overall the Bracketron iTilt is a brilliantly simple and affordable stand for tablets. Its compactness presents a package that tablet equipped travellers will no doubt desire.